The Tully Valley Mudboils are located South of Syracuse, NY in the Tully Valley. The first record of the mudboil appeared in about 1900. Mudboils are essentially springs. Just as other springs, groundwater is discharged from the mudboil. The Tully Valley has about 300 feet of glacial sediments, delta deposits and more. These fine clays and sands are made by the groundwater as it flows from the mudboils. The mudboils change, often forming over just a few weeks. 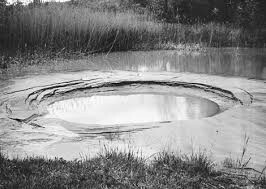 Sometimes the sediments are deposited around the spring forming a cone very similar to the shape of a volcano. Thus sometimes mudboils are called "mud volcanoes". As you might guess, as sediments are removed, the area must be subsiding. This has become a big problem for nearby residents as land collapses into depression areas. When we visited the mudboils they were not round with a lot of moister on the inside they looked more scattered and flat. When we went to the Tully Valley Mudboils. When we went to Tully Valley, we visited the Mudboils. We walked on the Mudboils and learned how they were formed, and what they were made of. Dr. Kappel showed us a map of Tully Valley and took us to the Mudboils. We got the chance to walk and experience what most kids don't see. We were able to feel and see the damage the Mudboils have done. This is the picture Mrs. Verbeck took of the mudboils leaking into Onondaga Creek. In this video is shows kids stepping on the Mudboils and you can see how it looks like you will sink in when you step on it. 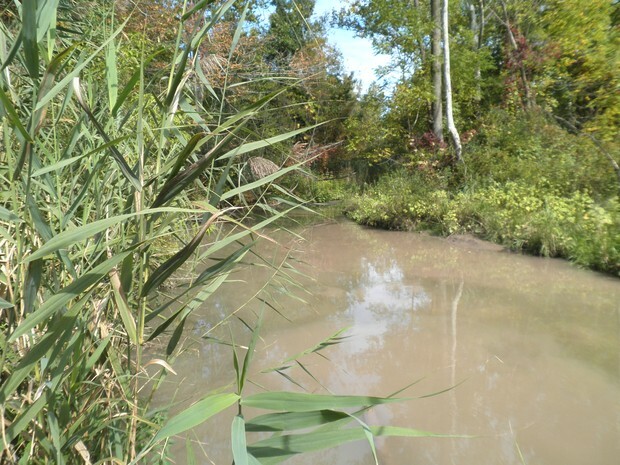 The Tully Valley Mudboils are important to the overall recovery of Onondaga Lake!! The mudboils relate to the Onondaga Lake Cleanup efforts by Honeywell and Onondaga County in many ways. Through a signed 2010 Consent Order that requires local environmental benefit projects, Honeywell will provide funding for five years to help address the mudboil problem on Onondaga Creek.the Onondaga Lake Partnership has supported, through the efforts of the United States Geologic Survey, the following activities since 1992. Diversion of surface water away from the mud boils. Installation of a dam on the stream that flows from the mud boil area. Drilling of wells to reduce pressure around the mud-boils.These efforts have been successful in reducing the amount of sediment flowing into the Onondaga Creek, to less than 1 ton a day. Damage done to Onondaga Creek by the Mudboils. Onondaga Creek has a murky muddy-brown appearance especially during high. Most of these materials come from the Tully Valley Mudboils. Much of the stream bed below from the mudboil area is covered with sediments released from the Mudboils. Onondaga Creek contributes more than 50% of the annual tributary sediment load to the lake due in large part to the mudboils. This is a picture of a mudboil close up. In the picture its shows the water flowing over top of the sediments.